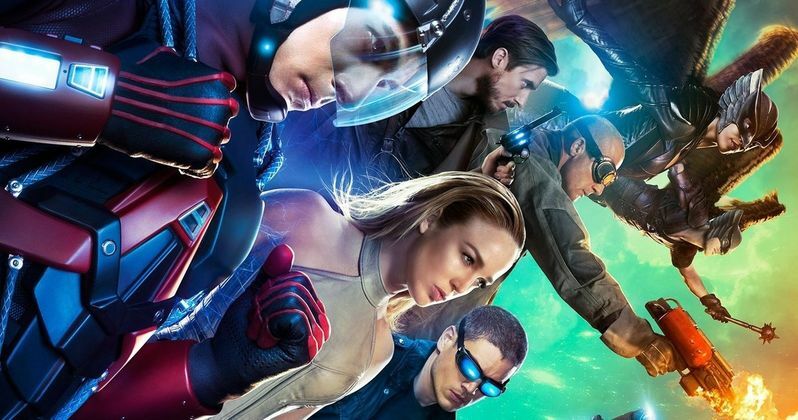 The series premiere of DC's Legends of Tomorrow and the Season 3 premiere of The 100 combined to give The CW its most watched Thursday night (2.56 million) in more than three years (since 10/11/12) and its highest rated Thursday night in adults 18-49 (1.0/3) in more than two years (since 11/21/13). Legends drew a 1.2/4 in adults 18-49, beating both ABC and NBC in the 8:00-9:00 pm hour, and giving The CW its most-watched telecast (3.14 million) in the time period in more than three years (11/1/12), and The CW's highest adults 18-49 rating in the time period in two years (1/23/14, The Vampire Diaries 100th episode). It was also the highest rating in the time period among men 18-49 in nearly six years (2/4/10). Legends also beat ABC and NBC in the hour in adults 18-34 (0.8/4), and men 18-49 (1.4/5), and was #2 in men 18-34 (0.9/4). Legends was The CW's most-watched and highest-rated series premiere since The Flash debuted to record numbers on 10/7/14. Legends more than doubled this season's time period averages in total viewers (+165%), and adults 18-49 (+166%), and doubled the adults 18-34 average. At 9:00 pm, The 100 third season premiere had its highest-rated episode in adults 18-49 (0.7/2) since the series' second episode on 3/26/14, and its most watched episode (1.98 million) since 4/23/14. The 100 more than doubled this season's time period averages in total viewers (+107%) and nearly doubled the averages in adults 18-49 (+98%), and was also up +64% in adults 18-34. Versus this same week last year, The CW was up a whopping +80% in total viewers for the night, +67% in adults 18-49, and +17% in adults 18-34. In related news, The CW released new photos from DC's Legends of Tomorrow's second episode, dubbed Pilot Part 2, which will air on Thursday, January 28, which showcases current Arrow villain Damien Darhk (Neal McDonough). The episode centers on this team of "legends," who, after being tipped off to Vandal Savage's (guest star Casper Crump) whereabouts, the team infiltrates a munitions deal with Professor Stein as their leader. Surrounded by some of the toughest criminals in the world, things quickly go from bad to worse when Savage realizes they don't belong there. A massive fight ensues and a piece of the Atom's suit falls off and into the wrong hands, which could potentially cause disastrous consequences in the future. Stein realizes the best way to retrieve the missing piece is to contact a brilliant man - his younger self. He, Sara and Jax head off in search of young Martin Stein (guest star Graeme McComb), much to Rip's consternation. Meanwhile, Snart and Rory plan to steal a key element in defeating Savage but still unsure of his new teammates, Ray demands to come along on the mission. Carter helps Kendra remember something vital. Take a look at the new photos below, and stay tuned for more on DC's Legends of Tomorrow.